A ghost named Tony haunts the Brunswick Inn. He was a riverboat harpist who drowned in 1882 while on a visit here, and he likes to wander through the inn's halls and play tricks on the owners. 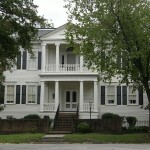 Bellamy Mansion is believed to be haunted by members of the Bellamy family and their servants. Investigators have recorded several EVPs and witnessed slamming doors. The World War II battleship is believed to be haunted by a blond sailor who shows up in passageways and another sailor who peeks out from portholes. Witnesses say hatch doors slam, cold spots are felt and footsteps are heard. This place has been on Haunted America, National Geographic Haunted, and several other media projects. Faces, shadows, orbs and all manner of strange things are seen by staff and visitors alike. Built by Capt. Sabiston in the 1850s, it is believed he still haunts the place to this day. The Elizabeth Inn is unfortunately now closed. Though no longer currently operating as an inn, this old brick home was said to have had two haunted rooms. 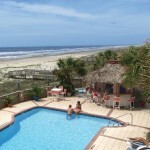 The owners received multiple reports from guests of various "odd occurrences" that happened during different stays. 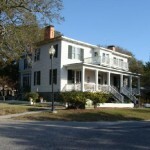 The Mansfield Plantation dates back to the early 18th century, and includes a bed and breakfast. 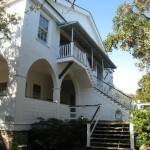 Local ghost hunters claim that they recorded EVPs in the North Guest House that said "don't leave me". The headless ghost of a beheaded British soldier is said to appear here, wandering about holidng a pistol and feeling around for his head. Along with him come the sounds of war, clattering and hoofbeats. The war sounds are often a precursor to the ghost's arrival. Originally built in 1790, the Attmore-Oliver House is reported to be haunted by poltergeists, possibly stemming from the last private owner or from deaths during a long-ago smallpox epidemic. 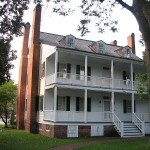 The large historic home, normally used for Society functions, is open for tours by appointment. This house boasts a haunted stairway where the ghost of a young woman is often seen. Reports of sightings date back for over a hundred years and continue to this day. People claim to see a young woman descending or ascending the stairs, who then vanishes. Phantom gunfire and shouts have been heard on the battlefield at night, and the ghost of a girl who died of tuberculosis is believed to haunt an upstairs room in the plantation house. 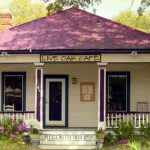 Although this building no longer operates as a B&B, back in the day it was said that a rocking chair in the "Rice Planter's Room" would often rock back and forth without anyone ever touching it. 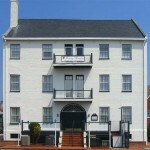 This building was once used as a Civil War hospital for Union soldiers. Some folks say the strange sounds that come from the dining room are the sounds of Satan forcing the souls of the soldiers who died there to relive their last miserable moments.